Hey gang, Valkor here. I never really knew the importance of having a solid, protective case for my smartphone until the day I dropped and smashed the screen of my Galaxy Note 2. In short, it was the worst day ever. Thankfully I had a backup phone and after I got the Note 2 up to snuff, I was extra careful but still hadn't found a case that suited me. 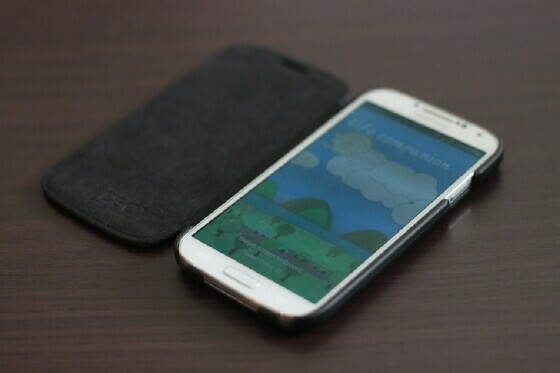 Then the company Tech21, with their "impactology", walked into my life and while I'm still extra careful, I'm less frazzled when my smartphone faces a minor drop or bump thanks to their "Impact Snap with Cover" case for the Samsung Galaxy Note 2. And for you iPhone 5 users, we're gonna be playing with the Impact Bands. That's right Tech21 gets a dual review in the TOV Val-Cave. 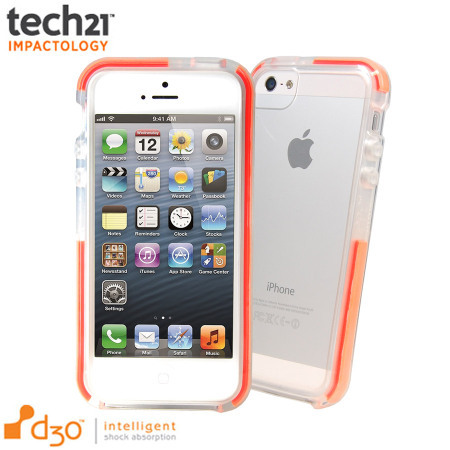 And with all the cracked up phones I've seen recently, me thinks the time for Tech21's Impact cases has arrived. It's all about the molecules inside the revolutionary D3O® Impact Material. In everyday use, the molecules flow freely, but upon shock or impact they lock together - absorbing the impact force and spreading the shock evenly across the surface of the material. That means your device stays in one piece, no matter how hard the impact! The most common cause for most smartphones and tablets being broken is due to drops. And with Tech21's impact technology, you'll greatly reduce the chances of breaking your device when it falls. With the Impact Snap case for the Note 2, you'll notice the d30 impact protection from the inside lining of the case, and the phone easily "snaps" into place, with all ports open so you have easy access to your charging ports, camera, SPen, power and volume controls. 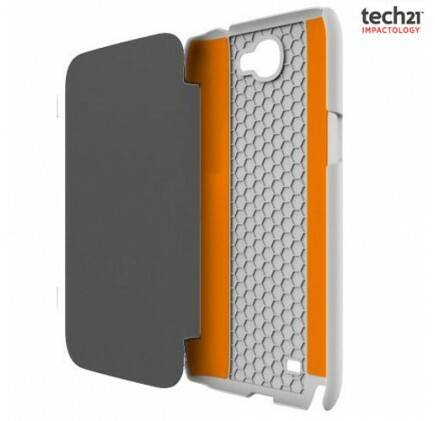 Also, the cover features a soft felt lining that protects the screen from scratches. 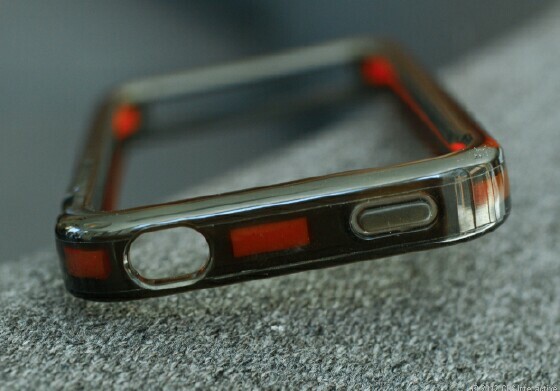 Now the Impact Bands work differently; this style of casing fits around the phone, with thick orange bumpers along the edges and a clear plastic back, with a cutout for the camera. 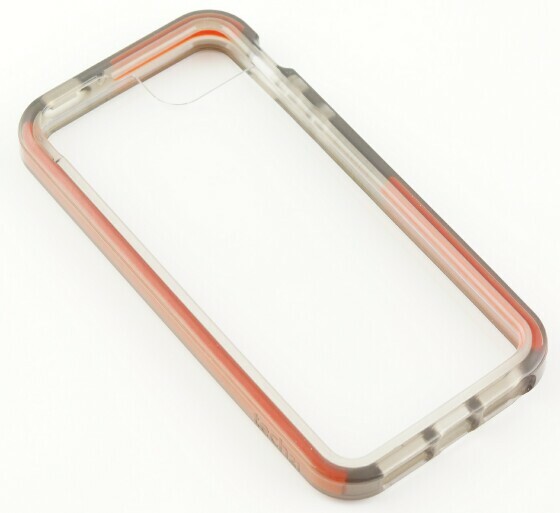 The case features openings for power and headphone jack, and flexible buttons for the volume control and power/reset button. To see how well the Impact Snap and Band cases worked, I dropped both phones from waist height (I'm 5' 11", so I dare go no higher); I was crazy nervous, but both phones survived their respective drops, in perfect working condition and no cracks on the glass. I even simulated the drop what caused my phone to break the first time, having it fall flat with the screen facing down, and again not a scratch. So seeing as both the iPhone 5 and the Note 2 survived my testing, but are these cases really ready for primetime? Absolutely! With Tech21's Impact Bands and Snap cases, you're getting a case that's built to withstand some pretty harsh conditions – from bumps, bangs, drops, and tumbles, investing in a Tech21 case will save you oodles of cash in the long term; FYI it cost me 300 bucks to repair my Note 2. 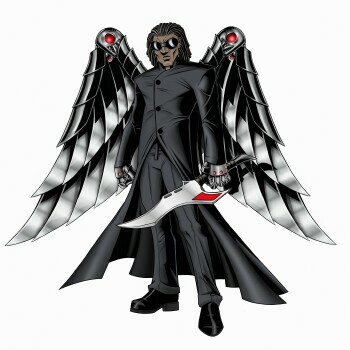 The designs are very sleek, and with each style you're only adding a bit of width to your device. 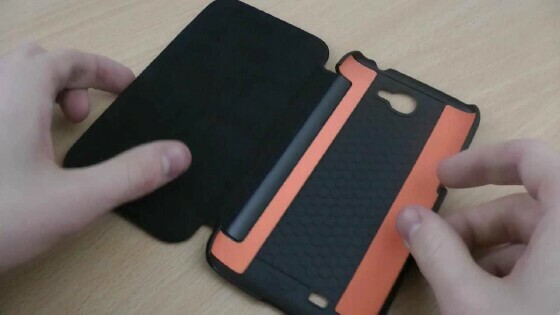 And with the Snap cases, some weight, but overall it doesn't hinder or feel bulky. With the Impact Band, the bumpers adds a nice grip to the phone, making it easier to hold and less likely to simply "slip away". Finally I gotta give plus points to the Snap Case, as the cover also acts as a kickstand of sort, allowing you to set your phone horizontally for watching a film or scrolling through images, apps, etc or just letting it sit there without having to hold the device. Tech21, you guys are off to a promising start. Very nitpicky, but the Snap case feels slippery at times. You can pick up a Tech21 Impact Snap case or Band in a wide variety of colors and for your phone of choice, not just the ones mentioned here. Both the Snap case and Band provide optimal protection, using a new and unique technology, with impressive results. Interested? Click that logo to the right and see what the company has to offer. And as it stands, I'm scoring both the Impact Bands and the Snap Case with Cover a 5 out of TOV 5 stars. Tested and Approved? You better believe it!